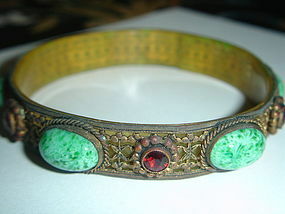 Fabulous Victorian to Art Deco Brass Filigree with Peking and Garnet glass stones. The inside is backed with celluloid. Good used condition consistent with normal use. Measures appx 5/8 inch wide and 2 7/8 inch inner diameter. Weight is appx) 42.5 g. No hallmarks but it is the signature work of Neiger Bros. Very Collectible and Wearable.